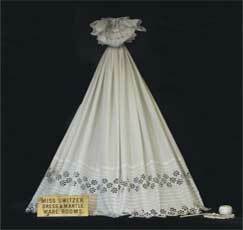 Hand embroidered and hand sewn by the Switzer sisters of Courtmatrix in 1875 for Mrs. Elizabeth Doupe, Ballingrane. Donated by: Lily Baker, Ireland. Solid Brass wall plaque weighing 700g. found in the soil beneath one of the entrance gate piers at the home of Jacob Switzer, Courtmatrix. The plaque has been restored by Norman Teskey of Courtmatrix. Jackie & Caroline Sheehan, Ireland. Dated 1750. Still encased with in its original binding, this beautifully rich and authentic artefact was presented to the Museum during the Palatines To Ireland holiday, organized by the IPA in September 1995. The item originates from the Palatinate. Today it still bears the reminder of all those who handled it, recognisable by the brown tinged corners which define each page. 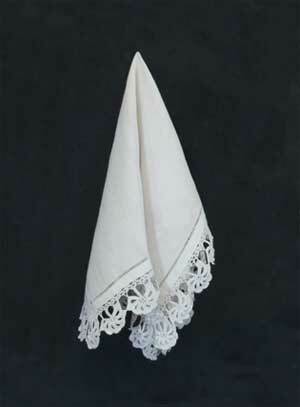 Made from linen woven from flax grown by Palatine families in the early 19th century. 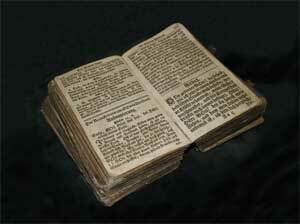 The Bible bears the handwritten inscription; "The Bible - Within this awful volume lies, the mystery of mysteries. Happiest they of Human Race, to whom their God has given grace. To read, to fear, to hope, to pray. To lift the latch, to force the way. And better they had ne’re been born, than read to doubt and read to scorn". When the Wesleyan Chapel was closed in Killeheen, as a result of the opening of the Methodist Church in Rathkeale, the items from the chapel were divided amongst the Palatine families of Killeheen. 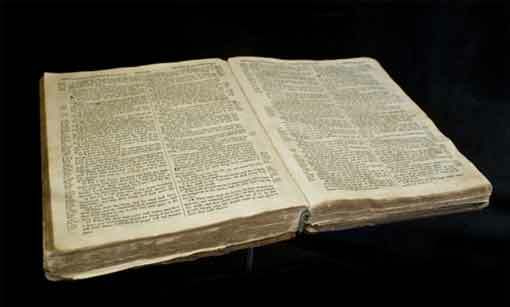 The Bible has remained in the Bovenizer family since that time.